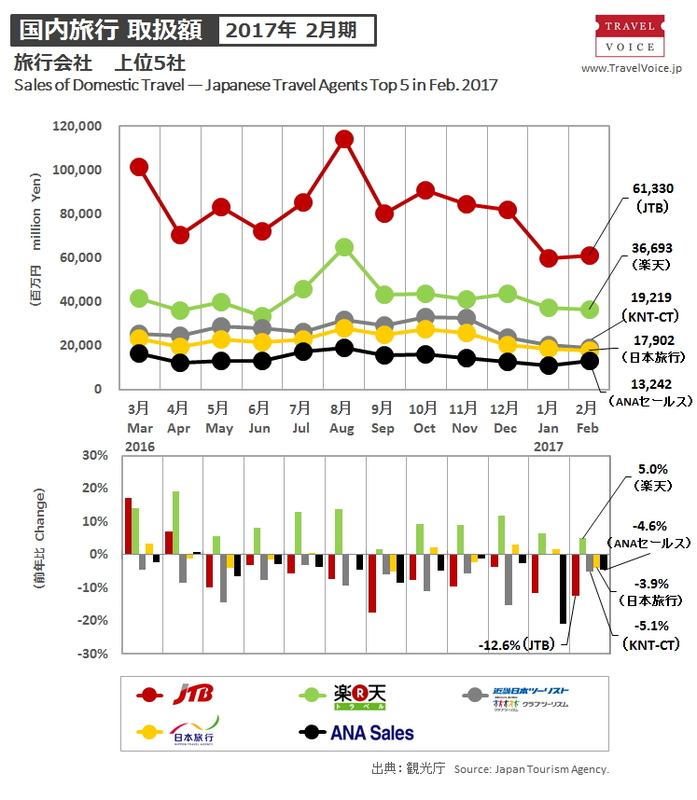 Japan Tourism Agency (JTA) announced that sales of 49 major Japanese travel agents amounted to 408.8 billion yen in total in February 2017 (-1.3%), which consisted of 165.1 billion yen for the outbound travel business (+2.9%), 14.5 billion yen for the inbound travel business (+25.3%) and 229.2 billion yen for the travel in Japan business (-5.4%). For outbound travel, out of the top five travel agents (15 JTB Group companies, five H.I.S. group companies, three Hankyu Travel Group companies, eight KNT-CT Group companies and NTA), H.I.S. was ranked 1st with 32.9 billion JPY (+8.7%), about 1.1 billion JPY more than the 2nd JTB Group. For inbound travel, among the top five travel agents (15 JTB group companies, five H.I.S. group companies, eight KNT-CT group companies, Rakuten and NTA), only Rakuten resulted in year-on-year reduction. H.I.S. moved down to the 3rd from the 2nd in January 2017. 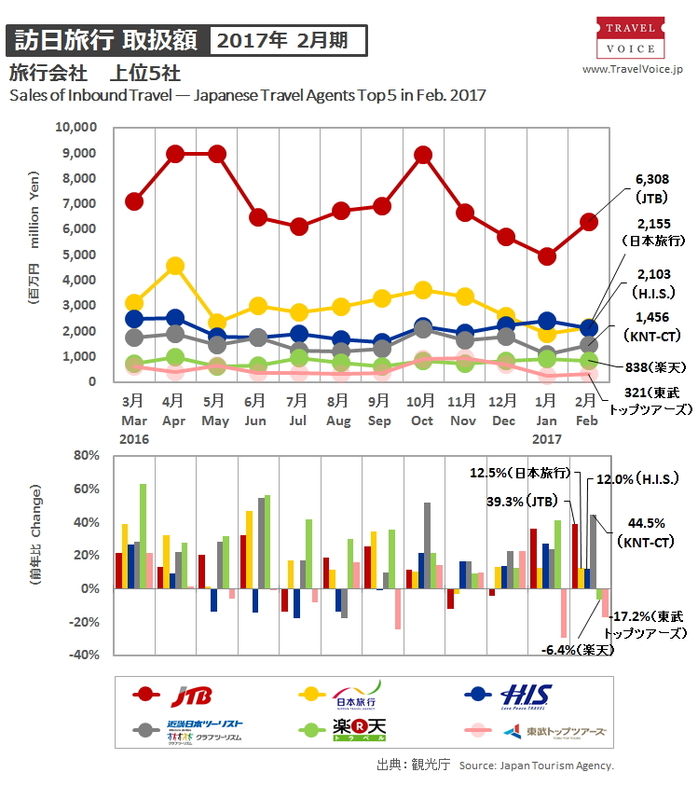 For travel in Japan, among the top five companies (15 JTB group companies, eight KNT-CT group companies, NTA, Rakuten and ANA Sales), only Rakuten succeeded in increasing transactions on a year on year basis, while JTB group resulted in year-on-year reductions for two months in a row. 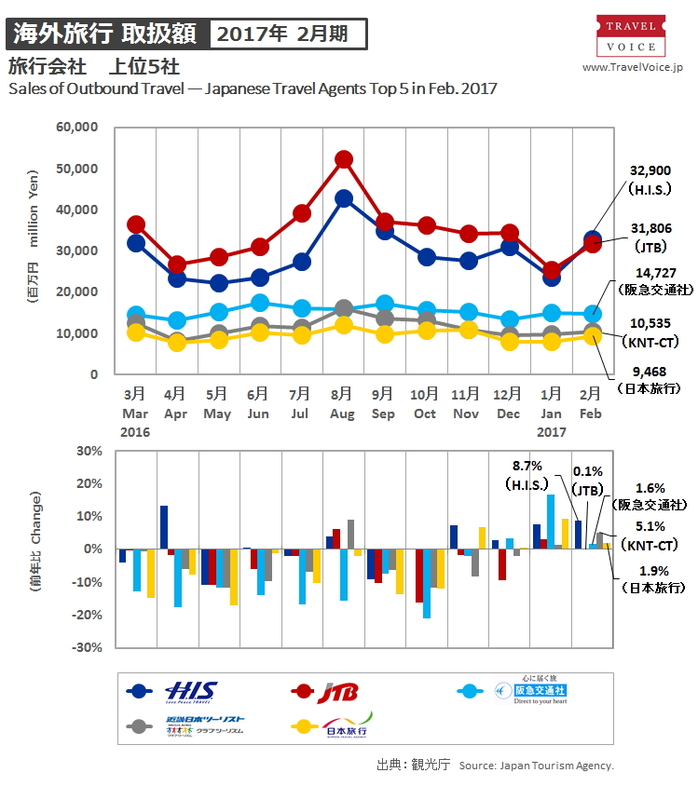 Transactions of package tour brand products totaled 113.1 billion JPY in February 2017 (-5.4%) with 2,776,922 customers in total (-8.7%). 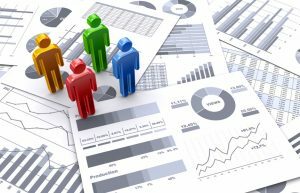 The total comprised 44.9 billion JPY (+-3.4%) with 274,581 customers (-3.0%) for outbound travel, 433 million JPY (-9.8%) with 30,452 customers (-0.6%) for inbound travel and 67.8 billion JPY (-6.7%) with 2,471,889 customers (-9.4%) for travel in Japan. According to hearings to travel companies, the outbound travel market was mainly boosted by a positive rebound from the terrorist attacks’ aftermath in Europe a year ago. In the inbound travel market, large-scale group travels, including travelers for Asian Winter Games in Sapporo, contributed to the market growth. The travel in Japan market was influenced by a negative rebound from the special ‘Furusato’ discount campaign a year ago.